24 Hour Battery Life! Extremely Loud w/Zero Distortion! 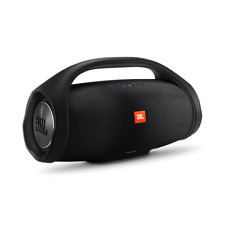 5 out of 5 stars - JBL Boombox BLACK Open Box - 100% PERFECT - Bluetooth Speaker. 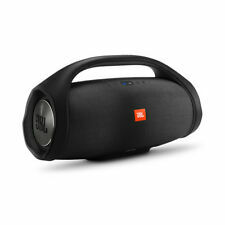 21 product ratings21 product ratings - JBL Boombox BLACK Open Box - 100% PERFECT - Bluetooth Speaker. Includes 2 x 2 W speakers. Original antenna and tight. ( Tape player play's at normal speed fast forward and rewinds also records. Unit has RCA inputs to play MP3 player or your phone, inputs work perfect. (Note MP3 player and cable not included.). ). This is the *only* listing by Aiwa with full warranty! Bluetooth FM USB TF. With Handle Easy to Carry. 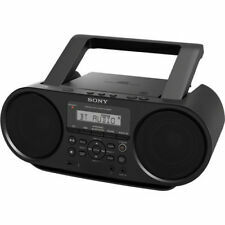 Features 5 AM/FM presets, digital tuner and bright LCD display with clock. Works with all 18-Volt NiCd and lithium-ion batteries, 12-Volt Max and 20-Volt Max batteries or hardwired AC power. EASILY CONNECTABLE: beFree has your convenience in mind. 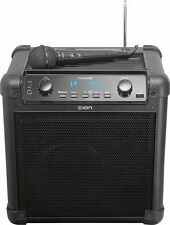 It also features a Microphone Jack for your wired microphone, or you can connect the included wireless microphone and feel free to move around while you dance and sing to your favorite karaoke tunes. GE 3-5267A Boombox. 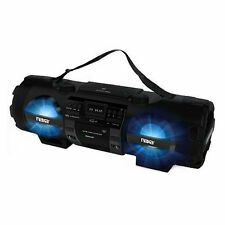 This is a 3 piece boombox with detachable speakers. Phono In and Aux in both work great. 22" x 7" x 10 1/2" (LxWxH). Runs good on batteries or A/C, Takes 8 d's. Both speakers sound loud and clear. Capable of producing crisp clear sounds in any of these formats, the boombox also features a digital turner, headphone jacks, and cassette-recording ability. Lightweight at only 1.9kg, it is a compact unit that is both portable and versatile. Rugged and durable design to withstand tough jobsite conditions. 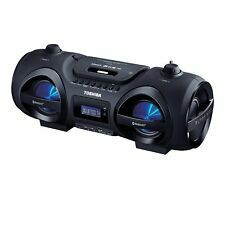 Can play via Bluetooth or auxiliary port. Power by 12-Volt/20-Volt Max batteries or AC power adaptor. 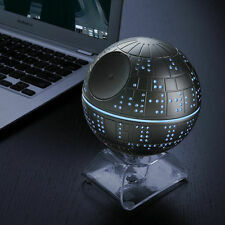 Included with this speaker is a wired microphone that can be connected to the Mic. Input on the front of the speaker. Also featured is a guitar jack so you can use this speaker as an amplifier for your electric guitar. We Have Continually Grown By Providing Quality Deals At Low Prices. Trending at $51.93eBay determines this price through a machine learned model of the product's sale prices within the last 90 days. High Quality. Buy 2 Gets FREE 3 Days Priority Mail.WOW! We Have Continually Grown By Providing Quality Deals At Low Prices. Since it is Pre-Owned; may show signs of use. USED PRODUCT. NICE Vintage SANYO M7880K Mini BOOMBOX with ORIGINAL BOX! Sold AS IS due to its age. This is a nice one! Very nice original condition. Minor scuffing on the lip that holds the very nice original antenna. It looks fantastic and very well cared for and the minor wear is not readily apparent. This is a high quality USA made radio and is all complete in original condition. Loudest and clearest sound on the market guaranteed! You will Receive: JBL Boombox - Black - OPEN BOX ITEM ​ Our Item will come in original packaging with original box and accessories. Packaging will be damaged, comes with original box and accessories. This item will be in the original packaging but may not be sealed. Stream music wirelessly with Bluetooth and NFC. Audio-in for use w/ MP3 players and other audio sources. CD, CD-R/RW, USB, and MP3 playback. Up to 26 hours battery life. JBL Xtreme 2 Black Portable Bluetooth Speaker - OPEN BOX - 100% PERFECT!!! AUTHORIZED DEALER. 60 DAY EXCHANGE POLICY! 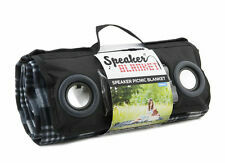 We developed what we consider to be the best combination of portability and sound. Video of ROCKBOX What is the Rockbox?. 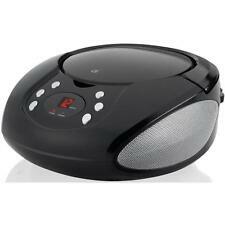 The Rockbox can play for 24 hours straight! Its’ 6000 mAH battery is 500% stronger than most our competitors. 1x Wired Mic. - Built in Bluetooth receiver for wireless connection with your Bluetooth-enable devices. 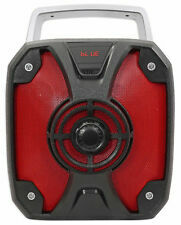 -8” High powered efficiency speaker system. 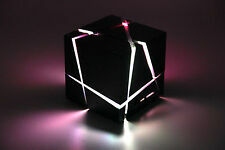 -Built-in colorful LED party lights moves with music playing. Includes Leather Carry Strap, Beautiful Design !!! Plays well with others An auxiliary audio input lets you connect almost any portable audio device to the Boombox for easy access to the music within (cable not included). Sony Personal Audio System, Wireless via Bluetooth, USB Port, Direct Jump Button. Sharp GF-9191 XBOOMBOX GHETTOBLASTER Stereo working!! PORTABLE BLUETOOTH BAZOOKA SPEAKER. INDOOR/OUTDOOR SPEAKER. 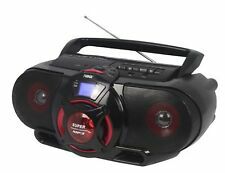 Vintage WORKING Sanyo 9935K BoomBox Ghetto Blaster Radio Cassette. Condition is Used. Great ahape everything works!! Cassette does not play but FF/FR works. Hard to find Japan import model. That`s fix(re-glued, see photo). Right side panel just under the radio tuning knob had cracks. 2 rear case screws are missing. Listening to music has been a favorite hobby for decades; originally, people could only listen to their favorite musicians in person at concerts. Then, when the radio was available for the home, people could listen to melodies that they liked at home or in their car. When the boombox came along, that changed as it provided a portable way of listening to their favorite songs even if they were away from their car or home. What are the notable features of boomboxes? One or two cassette tape decks - If there were two, you could record tunes from one cassette tape onto another. You could even record songs from the radio. 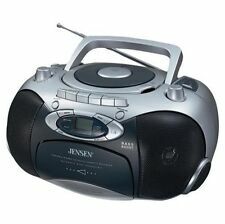 A CD player - Some boomboxes allow for CD-Rs and CD-RWs, which means you can record songs onto a CD from cassette tapes or the radio. How is the sound quality from a boombox? Audio is delivered through two attached amplified speakers. As a result, the sound quality is usually high. You can increase the acoustic quality from a boombox by adding more speakers. The acoustic quality also depends on the condition of the speakers and how high the volume is. Having the volume too high can affect the acoustic quality. Most boomboxes offer, in addition to the standard volume controls, balance controls. These balance controls enable you to adjust the balance of the sound output so it comes out one end of the boombox more than the other. That means the acoustic quality coming from one speaker will be higher than the other. 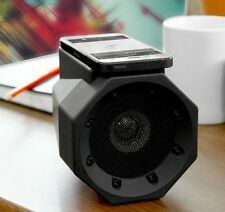 With a boombox, the acoustic quality is higher when the sound is balanced between both speakers. How much does a boombox weigh? Vintage large boomboxes can weigh up to 26 pounds, but later versions of large boomboxes are lightweight. There is also a variety in size for these devices. The smallest ones that are usually built for wireless audio, weigh two pounds or less.